Recently, FAB has had a name change to reflect more clearly the work the charity does to help improve the lives of millions of cats both in the UK and internationally. 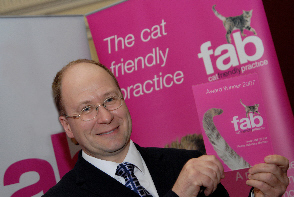 FAB is now known as International Cat Care. 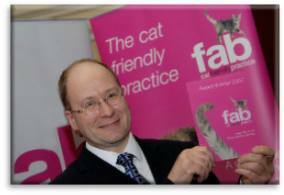 Opened in 2007, Just Cats Veterinary Clinic in Southport was one of only 8 practices nationwide to receive a Gold Award in the Feline Advisory Bureau (FAB) Cat Friendly Practice Awards ceremony in the Electric Cinema London on November 9th 2007. The aims of the competition were to raise awareness of the needs of cats at the Vets and make their visit less stressful for both cats and their owners. FAB received nominations from owners for practices across the UK. Nominated practices were asked to submit a report showing how they had made their practice feline friendly. International Cat Care is a charity dedicated to promoting the health and welfare of cats through improved feline knowledge, to help us all care better for our cats. The charity supports residencies at UK veterinary schools, providing advice to veterinary surgeons and health advice to cat owners through its website. For more information on the work of the charity go to www.icatcare.org. Practices were then short listed and the top awards only made after visits to the practices by veterinary surgeons who are recognised Feline Specialists. Simon Backshall, who is the practice owner said “We are delighted to receive this award. It is a credit to the practice staff who have worked hard to ensure a veterinary environment that is as stress free as possible for cats whilst providing a comprehensive healthcare service in a caring and personal way. 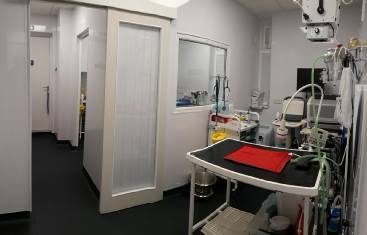 It has been my ambition to create a veterinary clinic which avoids the normal stresses experienced by cats when they go to the vets. Many cats do not like the close contact with dogs that a traditional vets waiting-room brings, or being hospitalised in a kennel above a dog. A feline only clinic tries to avoid the sights, smells and noises that causes stress. Feline only clinics are popular in the USA and are now springing up in the UK, however we are the first in the North West”. Cat owners are welcome to call in and look around. Over the past twelve months we have seen some significant changes to the practice, most notably our extension at the rear of the clinic. This has made room for a brand new operating theatre and anaesthetic preparation diagnostic suite. Designed by Simon, this has significantly increased not only the size of the practice, but also the range of facilities that we have to offer. This past year has also been busy for our nurses Louise and Carol, who have both been awarded the ISFM Certificate in Feline Nursing. Carol has also achieved a BVNA/BVDA Oral Care Certificate. This winter witnessed our second annual Christmas Craft Fair, raising money for Freshfields Animal Rescue. Hosted by a local artist studio, artists, Just Cats’ staff and their children helped to run stalls and a raffle whilst our lovely clients, friends and family popped in for a slice of cake and a spot of Christmas shopping. It was a lovely way to end a special year for Just Cats. Finally, this year has been particularly important for all the staff at Just Cats, as it marked our 10 year anniversary. Many of our staff members have worked here from the beginning, with a few brilliant new additions along the way, and so it has been a particularly special mile-stone. We enter 2018 in the hope of many more years to come with our furry feline friends. What a year it has been! We have been so busy our feet have barely touched the ground, and as always, it has been a pleasure to work with and care for the fabulous felines of Southport. These improvements have enabled us to be awarded the GOLD Standard certificate from the International Society of Feline Medicine as a Gold Cat Friendly Clinic, which is such a fabulous achievement, as we are the first practice in Merseyside to receive this. 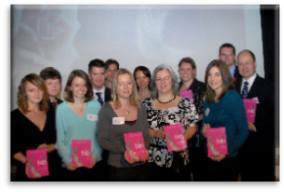 Our receptionists Becky, Helen and Rachel attended a Receptionist/Telephone Training day in April. We are very proud of them all!